I have an iPhone 7 plus with a Lifeproof case. Once I determined the correct vent to use in my Focus, it has worked great. I do wish it opened up just a little further to allow easier insertion of the phone into the clamps, but otherwise this is a solid device. Great price, too! After owning 4 other so-called vent phone mounts, this one is wonderful. None of the others held my phone as securely and visibly as this one. The others fell off when I traveled over bumpy roads and never seemed to fit right. This one easily attached to the vent, tightened securely and held fast. My search is over! Thanks, Grommet! 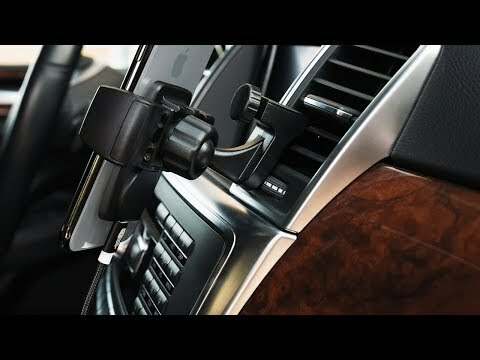 I can't tell you how many tiny pieces of plastic have been floating around my various cars over the years, all because of the cheaply-made and designed vent-based phone holders. They inevitably break and you just can't get the stupid things out once they're in. This one from Square Jellyfish is the best one I've found. Easy to install, easy to move, easy to take out, easy to use. Just what we all want and need, right? After owning 4 car vent phone mounts, I am very happy with this one. It holds onto the vent blades very tightly and doesn't fall off on bumpy roads. It was easy to install and holds my phone firmly at the angle I want. I'm so glad I found this and that I don't need to keep looking for one that will do the job. WoW, I love this due to the fact that it is held in place by "hooking" on to a vent fin. 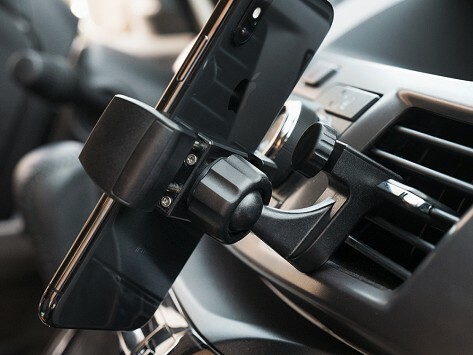 The vent phone mount was easy to install and very easy to use. It’s nice not to have to look for my phone or have it fall on the floor while I’m driving. This is a great gadget. Have tried other mounts which didn’t fit and this one does, beautifully! as advertised; easy to install and remove (altho why wd you want to?). we had been looking for something that wasnt' stuck to the dash and this is the perfect solution.